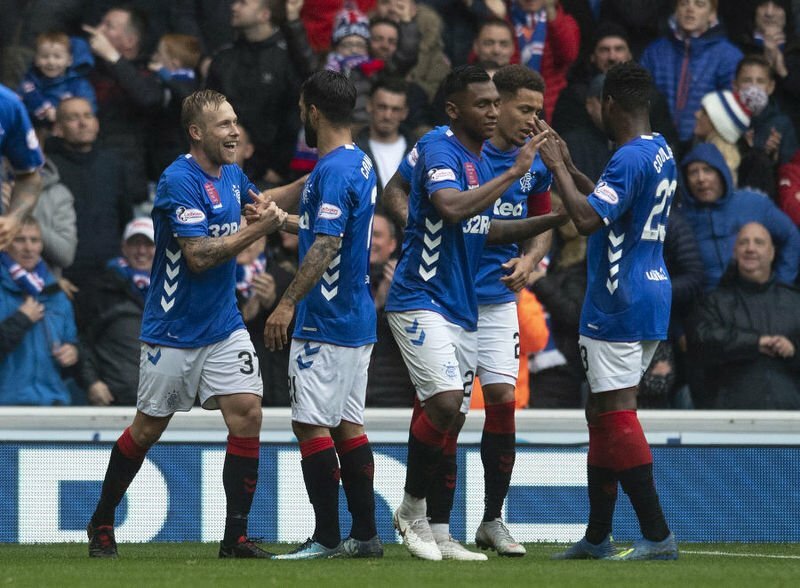 Rangers boss Steven Gerrard has challenged his players to take their Ibrox form into away matches as they bid to apply pressure at the top of the Premiership. The Light Blues inflicted high-flying Hearts’ first loss of the season with an impressive performance in Govan, the 3-1 victory moving the Gers into sixth spot, five points behind the Jambos. The game was all but over in the first-half with Rangers racing into a 3-0 lead after 32 minutes, Ryan Kent, Alfredo Morelos and Scott Arfield all on target as Craig Levein’s table-toppers were brushed aside. It was the Gers’ fourth league win out of four this season in front of their own fans and completed a good week after the shock defeat to Livingston – they beat Rapid Vienna in midweek in the Europa League. “I thought they were sensational,” Gerrard said of his players after the match. “I said it before the game and I wasn’t telling lies – Hearts are where they are on merit. “We’ve beaten a good team because we went to war with them and we matched them in the war and then our football shone through and that’s what you have to do in games like this. “This result had nothing to do with Livi and it doesn’t heal the Livingston performance which just wasn’t good enough. The match was a big disappointment for Hearts, who had travelled west confident of taking something from the game. They had Michael Smith sent off in the second half for a second bookable offence and will now regroup during the upcoming international break. There was a double boost for Celtic fans in Perth. After watching their team dismantle St Johnstone 6-0, the supporters heard boss Brendan Rodgers distance himself from the vacant Aston Villa job. The Northern Irishman, who has been under pressure for the first time in two years at Parkhead after a poor start to the both the European and domestic campaigns, insisted he still had ‘big job’ to do at Celtic. 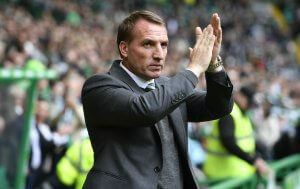 “I’m the Celtic manager and I love it and have lots of challenges here. There is always speculation. “I’ve got a great job here, a very exciting challenge this season. James Forrest netted four times in the first half at McDiarmid Park as Celtic went in at the interval 5-0 ahead. Callum McGregor completed the rout after Danny Swanson was red carded for scything down Forrest as he broke clear. It was an impressive response from the champions after their defeat to Salzburg in midweek. Hibs kept the pressure on their city rivals with a thumping 6-0 win over Hamilton Accies, the Easter Road outfit in superb form as they strolled to the victory which sees them just two points adrift of Hearts at the top going into the international break. Former Hearts boss Robbie Neilson is understood to be the No. 1 target for Dundee United as they look for Csaba Laszlo’s successor. The Hungarian was dismissed after a poor run of results and Neilson, who turned down St Mirren in the summer, is thought to be in pole position to take the Tannadice post. The 38-year-old is expected to have talks with the Tangerines at the start of the week, with the Championship side said to be ready to appoint him before the weekend providing the discussions go well. United’s defeat to league leaders Ayr United at the weekend left them eight points behind the Somerset Park side. Championship rivals Partick Thistle, meanwhile, are also on the look-out for a new manager after long-serving Alan Archibald was axed by the Firhill club. Next News Has technology boosted the retail supply chain?